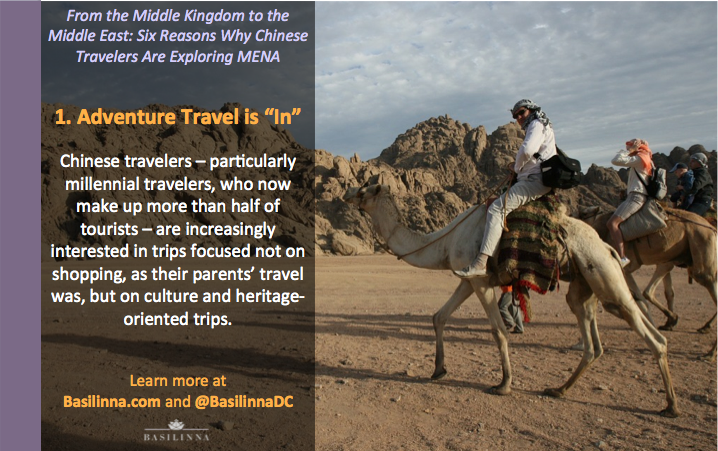 Chinese travelers – particularly millennial travelers, who now make up more than half of tourists – are increasingly interested in trips focused not on shopping, as their parents’ travel was, but on culture and heritage-oriented trips. In addition to the Giza Pyramids, Luxor, and other famous heritage sites in Israel, Lebanon, and North Africa, lesser known cultural destinations have brought in Chinese tourists. Governments are beginning to offer events such as Egypt’s Afro-Chinese Arts and Folklore Festival, which features performances and works from Egypt, China, and a range of African nations, to attract tourists from the Middle Kingdom. Luxury trips with a religious theme have become popular, too: Egyptian officials are now offering high-end tours such as the “Holy Family” tour series, which traces the Biblical path of Mary, Joseph, and Jesus’ escape from King Herod down the Nile. For most of modern Chinese history, much of the world was prohibitively difficult for Chinese tourists to travel to; even as recently as 2010, only 18 countries were visa-free for Chinese citizens. 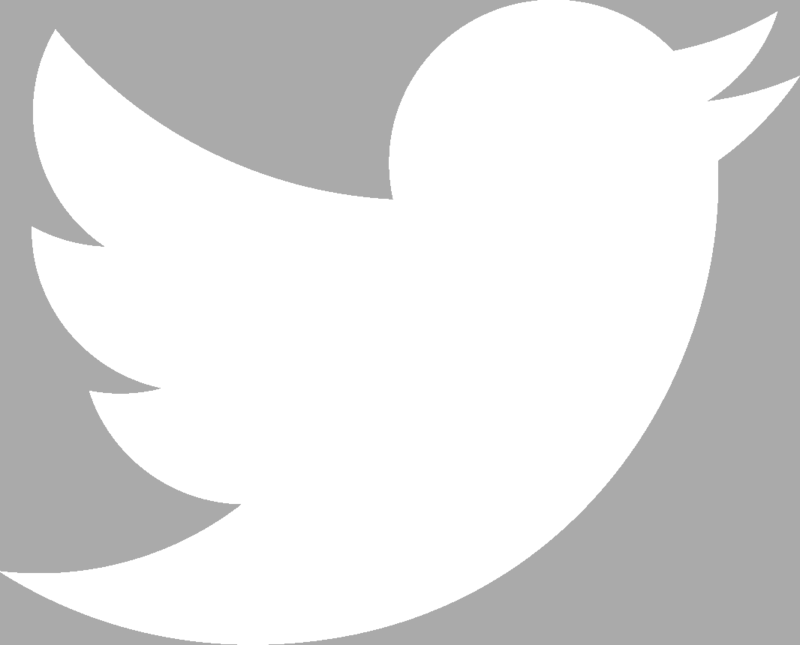 However, in the past several years, the Middle East has led the charge on loosening visa requirements. 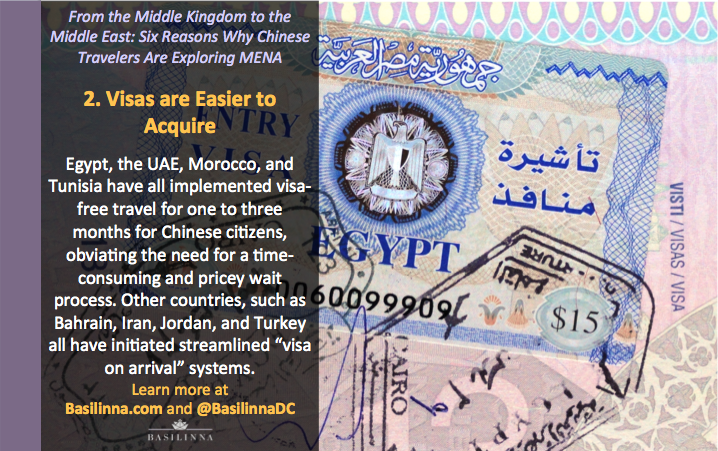 Egypt, the UAE, Morocco, and Tunisia have all implemented visa-free travel for one to three months for Chinese citizens, obviating the need for a time-consuming and pricey wait process. 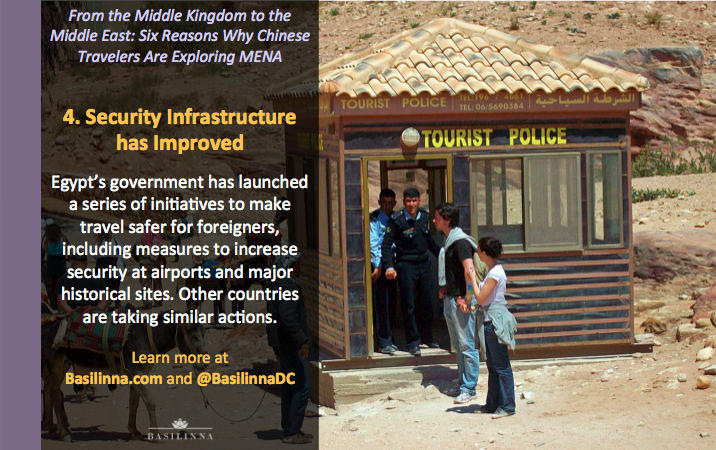 Other countries, such as Bahrain, Iran, Jordan, and Turkey all have initiated streamlined “visa on arrival” systems. Middle Eastern governments are also encouraging Chinese tourism by increasing the number of flights from China – EgyptAir now operates seven Guangzhou to Cairo flights a week – and offering more charter flights from major cities, including Beijing, Shanghai, and Chengdu. Thousands of years ago, the Sumerians built spas and pools that served as wellness centers for foreign visitors; today, their ancestors have built the region into a modern medical tourism hub. 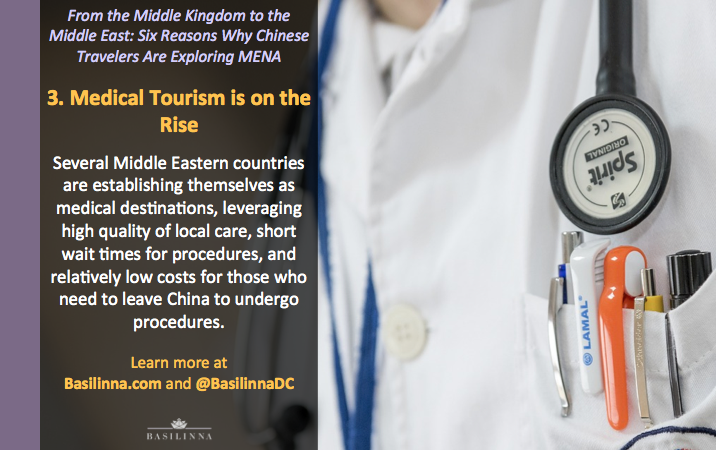 Several Middle Eastern countries are establishing themselves as medical destinations, leveraging high quality of local care, short wait times for procedures, and relatively low costs for those who need to leave China to undergo procedures. 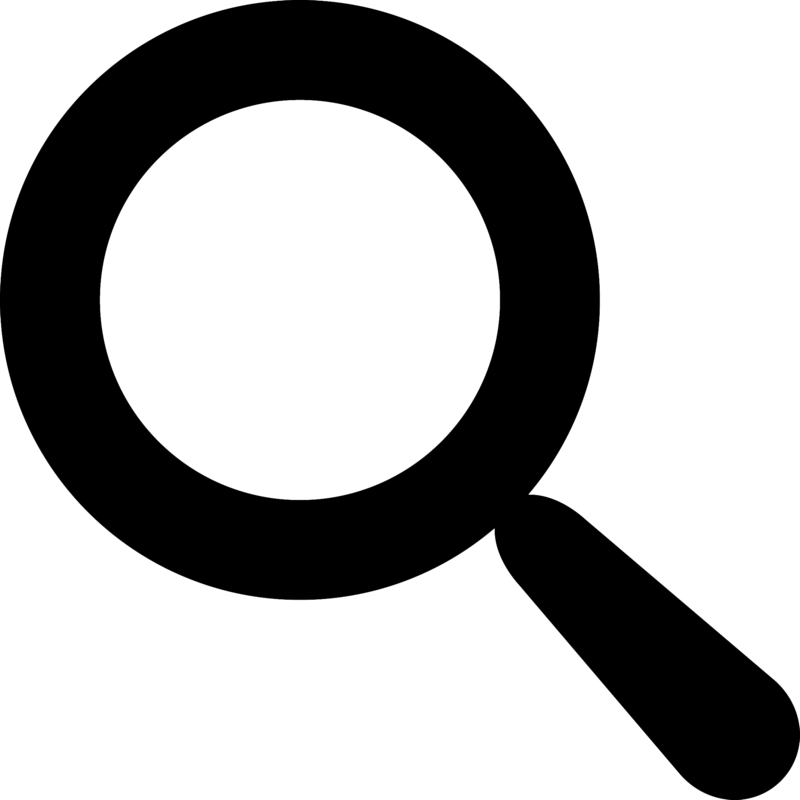 Many areas can also offer a warm, dry climate, as well as a range of tourist attractions, for convalescing patients. Egypt is seeking to become a leading destination for medical tourists, with a focus on healing Hepatitis C, and is working to bring in 100,000 patients this year. The Health Ministry is also recruiting high-profile ambassadors for its initiatives, including the Argentine football superstar Lionel Messi, who recently traveled around Egypt to promote the country’s medical offerings to the international community. In recent years, safety concerns have slowed travel to the Middle East. Egypt has faced a particularly rough period: the 2015 downing of a plane from Sharm El-Sheikh, recent Palm Sunday church bombings, and unrest in south Sinai have all spooked tourists. However, Egypt’s government has launched a series of initiatives to make travel safer for foreigners, including measures to increase security at airports and major historical sites. Other countries are taking similar actions: after two deadly attacks on tourist attractions, Tunisia has collaborated with G7 nations to improve aviation security through passenger and cargo screening, improve training for security officials, identify and remove extremist content posted online, and train hotel and tourism staff to respond to attacks. The Tunisian government has also built a 125-mile border wall with Libya to help prevent jihadists from crossing into the country. In part because of improved security, tourism in Tunisia is expected to jump 30 percent to around 6.5 million people this year. Many Middle Eastern economies are heavily reliant upon tourism. In Tunisia, one out of every eight workers is directly or indirectly involved in the tourism business; in the UAE, one of ten employees is. The tourism industry is also critical for foreign investment, visitor exports, and foreign currency, which countries facing liquidity crunches are heavily reliant upon. In recent years, however, the economies of the region have suffered from political instability, declining oil prices, weak foreign investment, and currency woes, making tourism revenue more critical than ever. 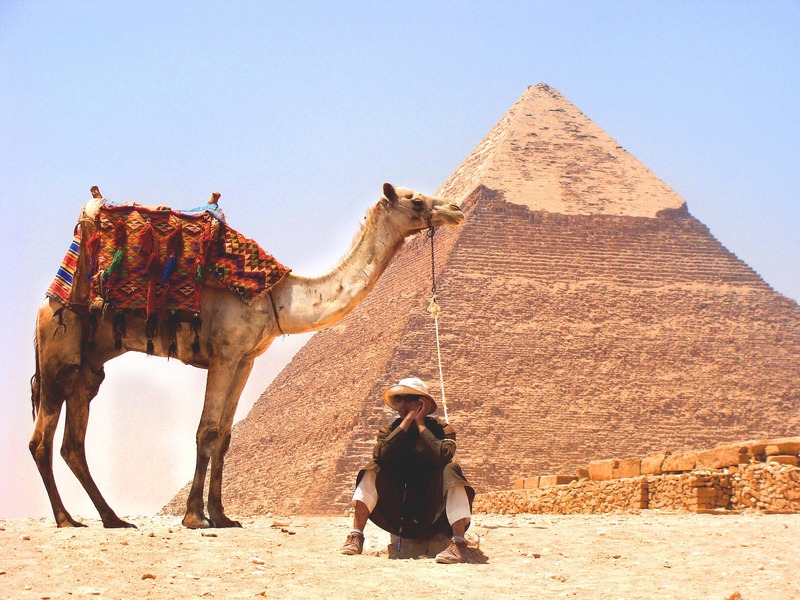 Egypt is especially eager for more tourism revenue; since the Arab Spring, revenues generated from the tourism industry have been halved, creating a $200 billion USD hit to the economy. The Egyptian government, along with many of its neighbors, will continue to aggressively campaign to bring in more travelers, with a focus on high-spending Chinese tourists. Chinese travel to the Middle East doesn’t only benefit the destination countries; the Chinese government is encouraging greater people-to-people engagement with the region to boost economic ties. 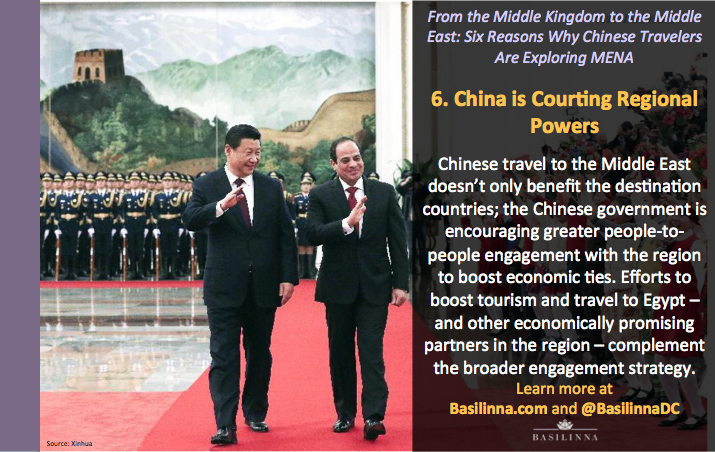 Following several visits to China from Egyptian President al-Sisi, Chinese President Xi Jinping paid a historic visit to Egypt in early 2016 to launch the “One Belt One Road” (OBOR) initiative, which seeks to build a trade network linking China, Central Asia, and the Arab World. OBOR is just one of several steps that the Chinese government is taking to strengthen its six-decade relationship with Cairo; China is also investing heavily in infrastructure and energy projects and is sending trade delegations to boost business ties between the nations. 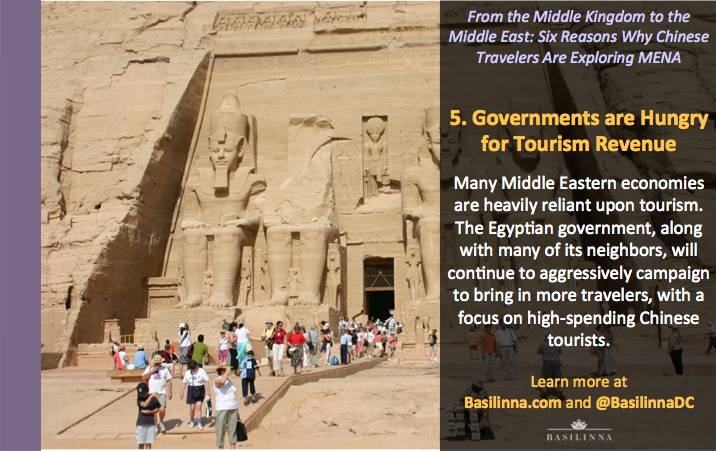 Efforts to boost tourism and travel to Egypt – and other economically promising partners in the region – complement the broader engagement strategy.